The next village that we come to is the beautiful village of Apeiranthos (32 km from Hora) which the Naxians call t’ Aperathou. It is built in the heart of the highlands of Naxos, at the foot of Mt Fanari, between two valleys, rich in vineyards and orchards. 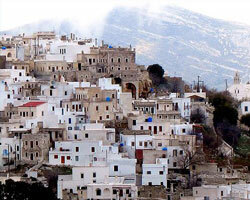 It is called «the marble village». 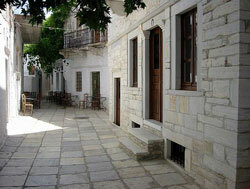 The architectural design of the houses in Apeiranthos has remained almost untouched since the time of the Venetian Empire: narrow marble paved mule tracks, often covered by archways; Venetian defense towers which are exemplary of the fortifications architecture of the time; two-storey stone houses with peculiar architectural details and tiny squares. The Zevgoli Tower (17th century) is very impressive, built on top of a rock at the entrance of the village. The people of Apeiranthos have some special characteristics compared to other Naxians and a different way of speaking. A lot of families fled to Apeiranthos from Cretan villages (Sfakia of Crete) after the revolution of Daska­logianni (1770) against the Turks which ended in bloodshed. This influx of people to the village had a positive effect on the character of the village. These people are dynamic, romantic and exhibit facility in expressing themselves through poetry (the traditional poems are called kotsakia). The women are very competent in the art of weaving.The three museums in Apeiranthos are well worth visiting (there is an archaeological, a geological and a folk museum), as is the exhibition area of the ladies handicraft centre.